In a large nonstick skillet, heat 1 tablespoon olive oil to medium heat. Add minced onion and garlic and saute 1-2 minutes, until just soft. Transfer to a medium mixing bowl. To the mixing bowl add cooked lentils, breadcrumbs, egg, 2 tablespoons chopped cilantro/parsley, lemon zest, curry powder, salt, black pepper and cayenne. Use a potato masher, or your hands, to mash mixture together until it’s meatloaf-like consistency and all ingredients are thoroughly combined. Heat remaining 1 ½ tablespoons olive oil in the same large nonstick skillet to medium-high heat. Use a 2-inch cookie scoop to form balls of lentil batter. Form into mini patties and place in the hot oil. Cook pancakes about 2 minutes per side, until browned and crispy, working in batches if needed. 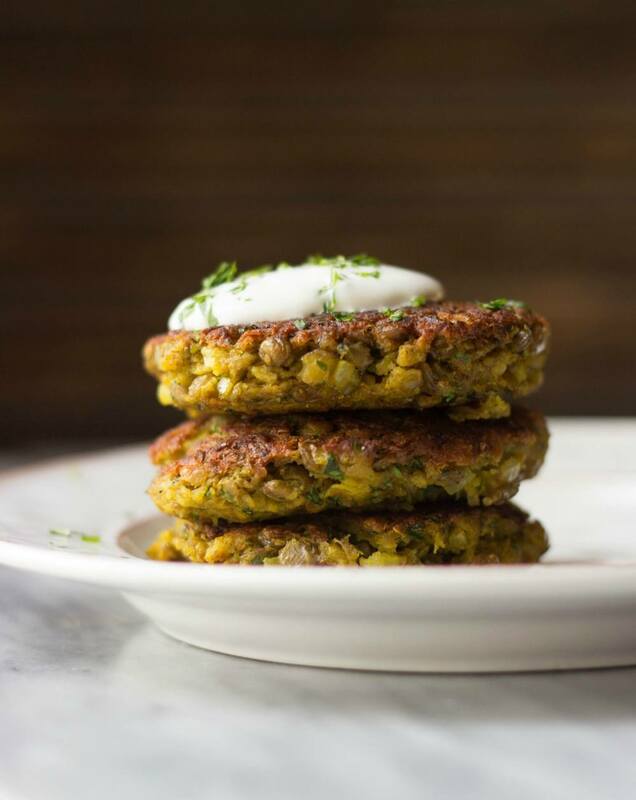 Serve lentil cakes with dollops of Greek yogurt and sprinkle with remaining 2 tablespoons chopped cilantro/parsley.